A lot of guys out there want to get that thick, well-defined beard, only to find when they grow one that it's patchy. The skin just isn't producing hair consistently enough to give them the look they want. But one thing could give hope in this battle of the beards. It's a substance called minoxidil, which has been used for years to help men with male pattern baldness. In fact, it's the only FDA approved medication for the treatment of androgenetic alopecia (male or female pattern baldness). 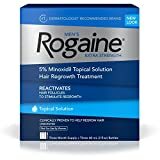 Usually known under the brand name Rogaine, minoxidil has been used for many years to thicken the hair on heads, and it's scientifically proven to do so. But many people are also now finding that using Rogaine for facial hair growth works as well. So let's take a look in depth at how you can potentially use minoxidil for beard growth, control and definition. There are potentially side-effects, and it's not an instant miracle cure, but using the information in this article, you can potentially get a thicker and more consistent beard growth by using Rogaine, or a generic minoxidil brand. What Is Minoxidil & What Does It Do? Do You Have To Use Rogaine On A Beard For Life? Should You Use Minoxidil Liquid Or Foam? Conclusion: So I Should Just Buy Rogaine And Slap It On? You might be surprised to learn that minoxidil was not designed to stimulate hair growth, and the fact that it does was only discovered by accident. Originally, minoxidil was prescribed to treat people with high blood pressure. But it wasn't even designed for that. Originally it was created to treat ulcers. The company who developed it found in trials on dogs that although it was not particularly good at curing ulcers, it did lower blood pressure considerably and consistently. So it was prescribed to people with high blood pressure, and it was only found during human clinical trials that people were noticing increased hair growth as well. After development, in 1988 the FDA classified minoxidil as a hair growth treatment product. It's usually sold in the USA under the brand name Rogaine. Despite all the attention and the facts around it stimulating hair growth, scientific studies haven't yet fully nailed down exactly how minoxidil stimulates hair growth. However, is known to be a potassium channel opener. This has the effect of stimulating circulation specifically in the area around the hair follicles, especially on the head. Stimulated circulation means more nutrients, oxygen and hormones traveling through and around the follicles, and it's thought this stimulates growth. Importantly, this growth also includes regrowth from dormant follicles. But to explain this we need to get a bit more technical about how hair works. Our hair has three phases of growth. These are the anagen, catagen and telogen phases. In the anagen phase the hair grows from active follicles. The catagen phase is where the growth of the hair stops, through signals being sent to the follicles to do so, which leads to the detaching of the bulb at the bottom hair from the follicle and shrinking the follicle itself. In the third telogen phase, the hair is shed and the follicle goes into a period of rest. In terms of most hair loss issues, especially male pattern baldness, it is a shortening of the anagen phase which starts to cause the hair loss. Eventually the follicles are not working for long enough to stay healthy and they become unhealthy, shrink and basically stop working, remaining dormant in the telogen phase, or worse dying completely. Minoxidil has been found to prolong the anagen phase – the active growth phase. It's also been found that using it at a topical concentration of 5% or above increases blood flow, but that this does not happen very much at a lower dose. It appears to be that minoxidil does not affect hormones or DHT for example, it merely promotes increased blood flow, provoking the hair follicles to remain active for longer. Scientists have also concluded that minoxidil appears to affect the immune system through the stimulation of the prostaglandin synthase-1 enzyme. Hair loss is also associated with negative changes in the human immune system which can lead to the closing of the hair follicles, which is why there is a growing belief that it can help to stop this mechanism occurring. So this is all brilliant news for getting rid of those patches and developing a thickened hairy beard right? Well, no. Not directly. There haven't actually been any clinical trials completed on using minoxidil to track increased hair growth anywhere other than on the human head. The FDA licensed specifically relates to hair growth on the scalp, nowhere else on the body. There is plenty of anecdotal evidence from people who have tried it that it does provoke hair growth on other parts of the body, especially male facial hair. Minoxidil doesn't care which area of the body it's being applied to. It is thought to stimulate better health and growth in hair follicles, and it doesn't know what hair follicles it stimulating. Hair follicles on the body are hair follicles, and localized stimulation is localized stimulation. There is absolutely no reason why topically applied minoxidil would only work on the scalp. Before we go any further, it's important to make sure that you have a dose of reality about the effects you can expect using Rogaine for facial hair growth. You will see tons of blog posts and articles with before and after photos showing amazing transformations. Thin, patchy beards transformed into superstars. Although this might be true, it's not typical. And even if it is typical it does not happen overnight. For a start, the three phases of hair growth together last for several months. Although the follicles might be stimulated, if they are resting, then nothing is going to happen until they enter the anagen phase again. And it could take several cycles before you start to see real, consistent results. So the myth of slapping it on and your hair dramatically growing in a few weeks is mostly false unless you catch it at the right stage of the cycle and your hair follicles are very responsive. What we are saying is that it doesn't promote a magical, instant response from the follicles, it just generates a stronger cycle time. Generally, you should realistically expect to wait several months to notice a difference. Many men report a significant difference only after 6-9 months. So using Rogaine on your beard is not a miracle cure or quick fix, but over the course of a year you should see great results. The great news is that you don't have to use Rogaine or another minoxidil product on your facial hair for life. We just talked about the fact you need several growth cycles for the effect to take hold and be visible. But once you see significant changes, you can stick at it for one more cycle, and then it should be okay to stop using it. The reason for this is that you are stimulating the follicles to become healthy and productive again. Once they are, they should continue to work in their natural cycle far better than before. Obviously if your hair starts to thin again, then there's no reason why you can't start using minoxidil for beard growth again. The original Rogaine is a 5% concentration liquid formula. There are also other brands and generic options out there containing that magical 5% or higher minoxidil concentration. But in terms of using it on the face, you have two main options, to use the original liquid formula, or a foam option. Minoxidil in liquid form is generally cheaper than the foam version. However, it also takes longer to dry. Because it's easier to distribute over the face and dries more quickly, minoxidil foam is the more popular product, which is why they can charge a higher price for it. So we would recommend you try that first. So let's talk a bit about using Rogaine for facial hair benefits, and how to mix in to your grooming routine. Wash your face thoroughly with ideally a pH balanced cleaner, or warm water. Scrub the face as well to get rid of dry hair and stimulate blood flow. Run your hands under a cold tap. This is because the foam version of Rogaine/minoxidil will dissolve more quickly in warm hands. Dispense a golf ball sized blob of foam onto one palm, rub both palms together very gently to distribute it on both hands, and then apply it gently across your beard in gentle strokes in all directions. Repeat steps 1 to 3 twice per day, leaving about 12 hours between each application. So first thing in the morning, and last thing at night before you go to bed will be ideal. Some people choose to wash off the minoxidil after about four hours, while others don't feel it affects them at all and leave it on for the whole day until they wash their face to put on the next application. It appears to be a personal choice that does not affect how the product works. Just be aware that it takes about four hours for minoxidil to reach 75% absorption into the skin. This is the minimum required for progress, so allow at least four hours if you do intend to wash off. In terms of normal beard grooming, you should carry on with your routine in exactly the same way as you normally would. The only difference would be not to shave after application. You should shave and complete your normal routine before applying Rogaine to your beard. In terms of moisturizing and using beard care product, these are actually fine to use, just make sure they are put on after treatment to avoid blocking access to the skin and follicles. Okay, so Rogaine seems to be brilliant for beard growth. You don't even need to buy Rogaine. There are lots of other brands of 5% concentration minoxidil out there, for as little as $25 a bottle. However, although it definitely works for beard growth, minoxidil can have side effects. But it's important to note that the side-effects were noted and highlighted when used on the scalp, which means a lot more application and a lot more of the active ingredient going into your body. You will experience dry skin. This is no real big deal because exfoliating and applying moisturizer can counter the effects. Hair shedding can also be experienced. This can feel quite dramatic at the start, but it's actually a good thing, it's the old hair being shed so that new and higher quality hair can grow. Increased or irregular heartbeat could occur. Remember we said that minoxidil was licensed by the FDA for combating high blood pressure. This could affect your heart rate if you are that way inclined, and it will also obviously potentially lower your blood pressure. So if you have heart problems or low blood pressure, speak to a doctor before using any type of minoxidil. This is not universal, but some people seem to gain weight when using Rogaine. It appears that minoxidil could stimulate appetite slightly. This could be true or false, and only you will work it out in the long run, but it's something to be aware of. Let's mention this one just for a laugh. One of the listed side effects of minoxidil is… excess hair growth! But I guess if you are using it for lowering blood pressure then you might get shocked when your hair starts growing thicker. It sounds almost too easy, but basically yes, you just buy Rogaine, or a cheaper minoxidil product, and put it on twice per day. But where it becomes difficult is in maintaining discipline. You have to stay on target you have to stick at it for several months. Hopefully you will see some benefits, after a few weeks or months you should start to see terminal hair known as “vellus” within your beard, which is a good sign because it means that hair is starting to regenerate from dormant follicles. Once the terminal hair starts to grow, you know that the follicles have been stimulated and that cycle is not going to end immediately. You can then keep using minoxidil until those hairs start to darken and then potentially stop using it. The bottom line here is that evidence exists in society and clinically that minoxidil works to stimulate hair growth on the scalp. There is literally no reason why it is not the same for beard growth, and any type of product containing the active ingredient will work. So why not give it a try? At what age can I use minoxidil the beard/hair growth? There is surprisingly no set age at which you can purchase and use minoxidil (sold under many brand names including Rograine). However, it is generally recommended that under 18's do not use it. The problem is that at a young age, your body and hair growth is not complete. Yes, you might know a 16-year-old who has enough hair to look like a monkey, but that is exceptional. So although anyone can use minoxidil for strengthening beard hair growth, unless your body is mature enough, then it is wasted effort that could actually just have negative consequences. Most men actually don't get to the full strength of their beard growth until into their 20s. However, it's obviously an independent and individual decision based on your own body and situation. Young skin is also more sensitive, which can lead to an increase in side effects, which is something else to bear in mind. Is minoxidil meant to be used to stimulate facial hair growth? Actually, the surprising answer is that no minoxidil isn't meant to be used on the face. In the USA, minoxidil brands are only licensed for use on the scalp, to address male pattern baldness. So if you pick up a box of minoxidil, you will find that it only gives instructions for using it on the scalp. It will often also have a disclaimer saying it's only to be used on the scalp as well. But this doesn't mean it doesn't work anywhere else. Hair growth and decline works the same way all over the human body. If you have declining, or incomplete, hair growth on your face, then applying it to the face would have exactly the same range of potential benefits as applying it to the scalp, legs, or wherever. However, it should be noted that on the flipside to that, the side-effects are the same as well. In fact, because the skin on your face is slightly more absorbent than on the scalp, more of the chemicals within minoxidil will be absorbed into the bloodstream. So it's important to be aware of the side-effects of using minoxidil before beginning to use it to stimulate beard growth. What happens when you first apply minoxidil to your face? Because minoxidil is more readily absorbed into the skin of the face than the scalp, you will notice side effects more readily. Nearly all new users of minoxidil encounter improved hair growth on the whole body. This includes new vellus hair. Vellus hair is a very fine type of hair that usually falls out after a short space of time, and does not regrow, unless that area is then directly stimulated with minoxidil. Many minoxidil users find that the extra hair generated will start to disappear after a few months, and that continuing to apply minoxidil to their beard has no further regrowth of vellus hair in other areas of the body. However, it does mean that if you start to use minoxidil to stimulate beard hair growth, you should be prepared to see the existing hair on your body acting in a slightly different way potentially. Does using minoxidil on facial hair produce bad side effects? In essence, side-effects from using minoxidil on your face to promote beard growth, rather than on your scalp, are exactly the same. However, the speed and severity is often increased. The first few times you apply minoxidil to your face to stimulate beard hair growth, you might find that your skin quickly becomes irritated. You should avoid itching it, and try not to use anything abrasive on your skin in the days after your first few applications. Sometimes the skin will redden. This will disappear after a few days, as your body gets used to minoxidil. Other than that, side-effects are generally around increased hair growth across the body. Some people do also report that they perceive an aging around the eyes, although this has not been clinically verified. How often should I apply minoxidil to stimulate facial hair growth? The key to understanding how often you should apply minoxidil your face, is about understanding how your body metabolizes minoxidil. Generally, minoxidil requires about 12 hours to the absorbed and metabolized. So if you apply it more frequently, then the additional will be wasted. Some users report a level of sensitivity that means that they can only apply minoxidil once per day anyway, but generally, it's fine to apply with a 12 hour gap. So it's perfectly possible to apply minoxidil to your face first thing in the morning, before you go to work, and again in the evening. Because minoxidil is more readily absorbed into facial skin, you could technically apply it three times per day, but because of increased chances of side-effects, this is not recommended. But as with many things, even if you want to risk it, more is often not better. Many people report no speeding up the hair growth, whether they apply minoxidil to the face once, twice, or even three times a day. How much minoxidil should I use on my beard? Beard hair is usually thicker and coarser than hair on the head, and in addition substances can cling to it more as well. So it may be that you need to use more than the recommended dose for scalp use. A good starting point is to wash your face with mild soap prior to using minoxidil on your beard. This will cleanse the hair, and warm water will slightly open the pores and clean the skin. You can then use the standard dose of minoxidil foam, usually with no problem. If you find that the length of your beard means that the standard dose from the product you have is not enough, then simply use a little more. The key is to not saturate the hair, by using the least extra you can to achieve full coverage. How long should minoxidil be left on the face? The maximum recommended time minoxidil the left on any skin is four hours. Clinical studies have proven that 50% or more is absorbed in the hour after application, and 75% within the first four hours. Leaving it on for longer has been found to have little additional benefit. You should bear in mind though that studies around absorption are based on the scalp, which is less absorbent than skin on the face. So it could be the case that most of the minoxidil is absorbed into the skin within the first couple of hours. So it's recommended to leave the minoxidil on your face for around two hours hours, and then gently washing your beard and face, and then apply a gentle moisturizer. If after a couple of months you are not seeing any improvement, then you could experiment with leaving on longer, or increasing number of applications per day. How long will it take to see results from using minoxidil on my beard? It's important to understand that every person is different. So one person might see results within the month, where as someone else might take as long as six months to see significant new hair growth. However, the bottom line is that it will take as long as your facial hair follicles need for new beard hair to grow, and mature, which is an individual thing. Initially, you should see some strengthening of growth within the first couple of months, and certainly within the first three months. It's also important to understand that this has to be an ongoing process, as the newly grown vellus hair has to fall out, then the follicle has to be read stimulate, and stronger terminal hair then grown. This process can take anything between six months and a year.